A comprehensive national picture of recycled and desalinated water sources for over 350 sites across the country in now available online, following the launch of a new web tool. 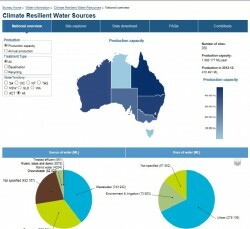 The Climate Resilient Water Sources Portal has been jointly developed by the Bureau of Meteorology, the Australian Water Recycling Centre of Excellence, the National Centre for Excellence in Desalination and CSIRO. The portal informs the Australian community, government and the water industry of the contribution that recycled and desalinated water make to securing water supplies for current and future needs.